Does it only have a cold water feed? If so then I'll stay away because if you want a hot shower you end up with no power, I am looking for a good non expensive one that has hot & cold water feed so I can have powerful hot showers! the 8,5kw sold out very quick!!! Pressure of cold feed is fine. It mainly depends on how good the heating element is and if it can heat that volume of water required. Pressure of cold feed is fine.It mainly depends on how good the heating … Pressure of cold feed is fine.It mainly depends on how good the heating element is and if it can heat that volume of water required. Can I try to agree with everyone here? You need both a good heating element AND decent water pressure - (apart from the 2 heat levels you might have if it has a "high" and "low" setting) the variable temperature on these showers works by increasing or decreasing the flow rate of water over the element, if you turn the temperature up, it slows the flow over the element keeping it in contact for longer and therefore making it hotter, turn it down and there is a higher/more powerful flow but less contact time and cooler water. The reason the pressure is also important is that these (generally speaking) have low pressure and over temperature switches (to avoid either scalding yourself or allowing the element to overheat), so if the water pressure is low and you turn the temperature down it may switch off the heating element (as the internal pressure will drop as there is less resistance to the flow), or equally if there is simply insufficient water flow due to low pressure the over temperature switch will cut the element out. As I understand it an inline pump should only be used where the shower is gravity fed from a tank NOT directly from mains pressure, so if (like me) you have a mains cold water fed electric shower you just have to live with it or change for one of the power units which DO take a hot and cold feed to provide a constant temperature. 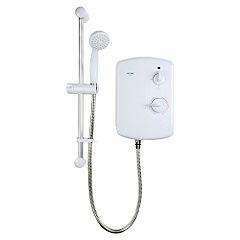 plumbworld had a 10.5 triton for £48 the other week, just watch out if you are upgrading from a smaller shower as you may need a bigger cable. Does it only have a cold water feed?If so then I'll stay away because if … Does it only have a cold water feed?If so then I'll stay away because if you want a hot shower you end up with no power, I am looking for a good non expensive one that has hot & cold water feed so I can have powerful hot showers! A warning however, Triton don't support their older showers with availability of parts in my experience. Out of interest, how much would it cost to have an electric shower installed? I am guessing as you would need a plumber and a electician, pricey. Out of interest, how much would it cost to have an electric shower … Out of interest, how much would it cost to have an electric shower installed? I am guessing as you would need a plumber and a electician, pricey. it depends on the shower KW rating which influences the cable size and how far the run is from the fuse box. But I doubt you get it done for less the £200. Dont get a plummer to do the electirc work unles he has electric quals as well. Why can't they be used with combi boilers? I have a gas combi boiler but would also like a powerful shower. Why can't they be used with combi boilers?I have a gas combi boiler but … Why can't they be used with combi boilers?I have a gas combi boiler but would also like a powerful shower. So what type of shower would be best allowing for powerful hot showers? Triton brand the exact same shower unit under many different names, depending on which retailer is selling them. I have recently replaced a Triton Ivory ( Homebase ), with a Triton Cara ( B&Q ) as they had it on offer. It was cheaper than the spare part, a valve, and a straight swop as backplate hole fixings identical as were the water and cable inlets. They can be contacted at their Nuneaton head office on, Tel: (024) 7634 4441 and will readily give you this info. as they are very helpful. all depends on what type of hot water system you have, if you have combi one like this is best but go for highest kw you can more kw generally more power, mira have a special combi one but its expensive, supposed to be quite powerful. if you have a hot water tank then you can get a power shower which uses your hot water and the power of the shower to give a powerful shower. To get a true power shower you need a hot tank so the shower unit is not doing any heating. A 10.5kw shower is still not a power shower , you are asking for miracles for a shower to heat and deliver a powerfull water spray (also not often suitable for domestic use even if you have the correct cable and mcb/rcd/rcbo as they can draw to much power through the fuseboard) . The price is good for a straight electric shower .